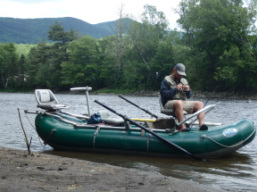 Drift boat trips are the best way to experience Vermont's larger rivers. From a drift boat you are able to reach water rarely fished by wading anglers, and where you will have the best shot at some of our largest wild fish. There are very few drift boats in Vermont making this trip a unique experience in the area, and in my opinion the most exciting, beautiful, and fun way to fish the area. 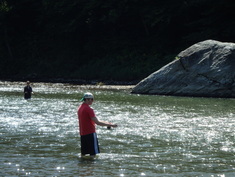 Wade fishing is the most common way to fish Vermont's rivers and streams. Depending on conditions, time of year, and preferences, we will be wading large rivers to small mountain brook trout streams. 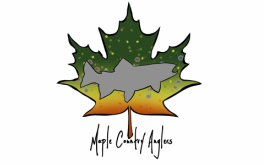 This is a great opportunity to tailor a trip to an evening hatch, or the early morning bite. 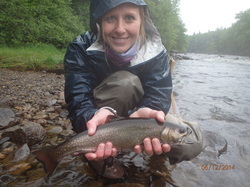 I offer multi day trips to the Rangeley, Maine Area in June and September for trophy wild Brook trout and wild Land Locked Atlantic Salmon. This is a true wilderness fishing experience for trophy fish that can measure upwards of 4 or 5 pounds. - Be prepared for any weather and fluctuating temperatures. Wool or dry fit type quick drying clothing, Wool socks. Dress in layers. - Gear; Feel free to bring your own rods, reels, flies, waders etc. Felt soled wading boots are illegal in Vermont, if you have fleet soled boots I will gladly provide you with wading boots. - DO NOT PAY DEPOSIT UNTIL YOU HAVE CONFIRMED YOUR DATE WITH BEN WILCOX VIA PHONE OR EMAIL!! !